We list the tools you’re most likely to need or use for any repairs on your caravan journey. Between rough roads and wild weather conditions, it can be hard to predict what your travels will have in store. Whether you’re changing tyres, fixing leaks or just doing general caravan maintenance on the road, it will be easier if you’re equipped with the right tools. Wheel brace and wrenches. A set of wheel braces, torque wrenches and socket wrenches will be essential for adjusting wheel nuts, and nuts and bolts throughout your rig. Corner steady handle/crank. Just the thing for adjusting your corner steadies but if you’re going off-road, look for one that’s designed specifically for the conditions. Electric screwdriver set. Apart from all their normal uses, electric screwdrivers can be used to drive ratchets and cranks. Cordless is best but make sure it’s charged at all times in case you need it for any caravan maintenance. Tyre lever and hammer. Sooner or later you’re going to have to replace a tyre, so make sure you have everything you need. The lever’s also useful for clearing away mud caked around the wheels. Grease and lubricant. Grease, WD40 and other lubricants help parts run smoothly but can also be used on ropes, awnings, zippers and window seals. Air compressor and tyre gauge. If you’re traveling over sand or fixing a flat, you’ll need to adjust the air pressure in your tyres. In these situations, an air compressor and gauge are your best friends. They can also help you out when drilling, tightening and loosening parts. Sealant. Keep this on hand to reseal a skylight, fix a leaking window or touch up a superficial gash while you’re on the go. Electrical and gaffer tape. The wonder tool. From patching superficial structural damage to repairing electrical parts, its uses are almost limitless. Chocks or wheel blocks. These will keep your vehicle or caravan in place when you’re working on it or parked on a slight slope. Cleaner and brushes. Keep a set of rags, brushes and cleaners (such as kerosene, car wash, Armor All or Simple Green) handy because you just never know what sort of messes you’ll be cleaning up. When you’re travelling in the Outback, brushes will help clear the bulldust out of everything. After a few trips out on the road it’s likely you’ll build your own list of necessary tools but for now we’ve given you a place to start. If you can match your vehicles and caravan’s tyres and other parts as well, the tools and spare parts will be a lot easier to match too. 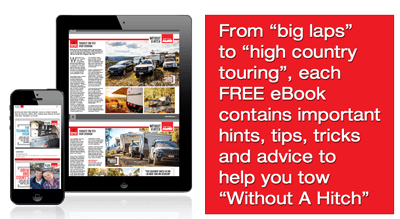 In case you ever have to change a tyre on your caravan while you’re on the road, be prepared with our step-by-step guide.